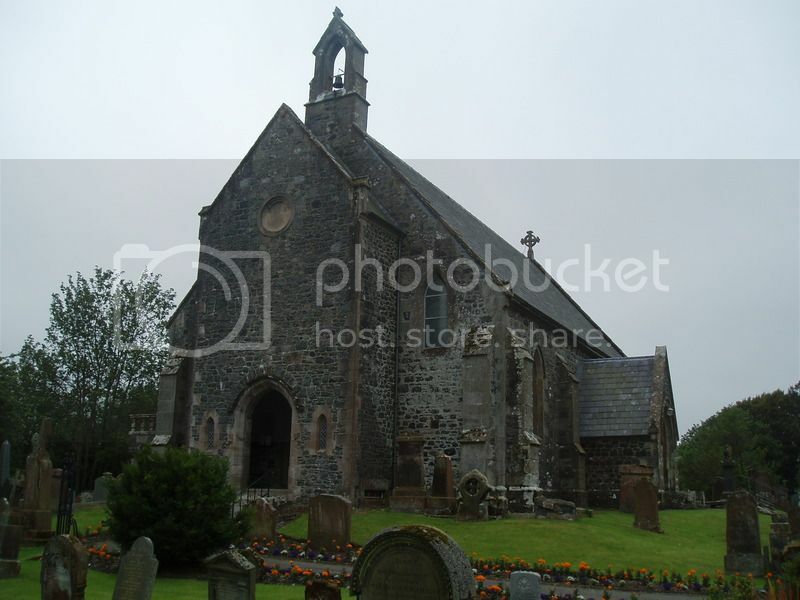 The Churchyard of St Colmon Parish Church in the village of Colmonell. Number of Commonwealth War Graves: 3. 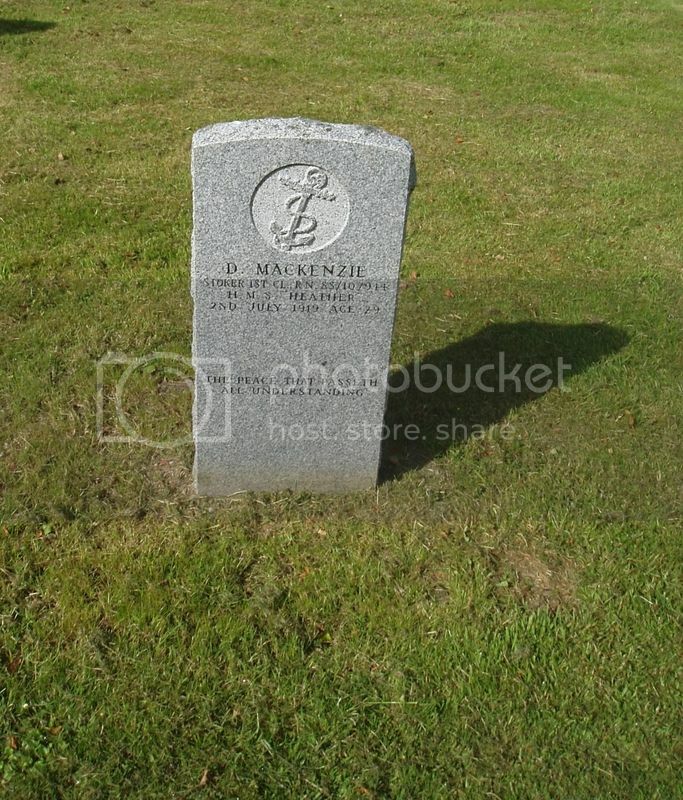 Additional information: Son of Donald and Jean Mackenzie, of "Hazelrigg," Vicarton St., Girvan. HMS Heather was an Aubretia Class Sloop. 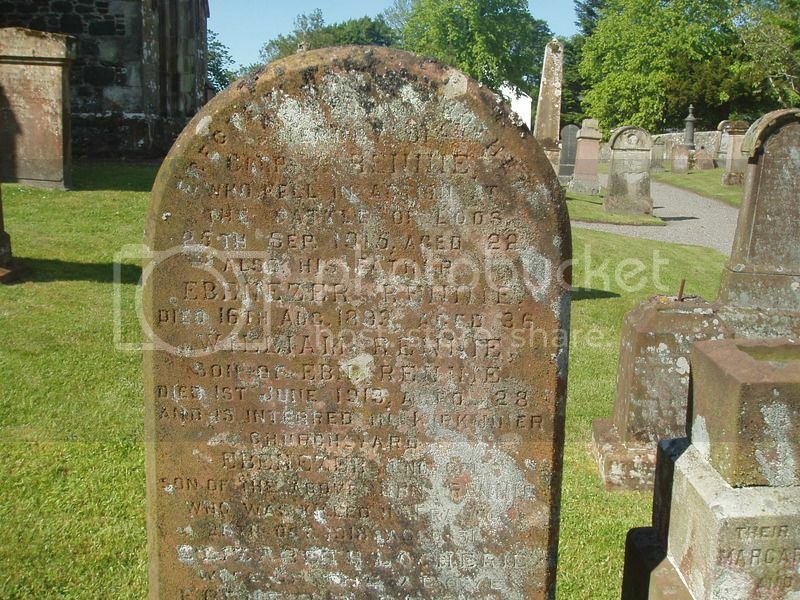 Additional information: Son of Peter McCallum, of Laigh Aldons, Pinwherry, Ayrshire. Also refers to Lieut Col CF Potter (Royal Artillery). 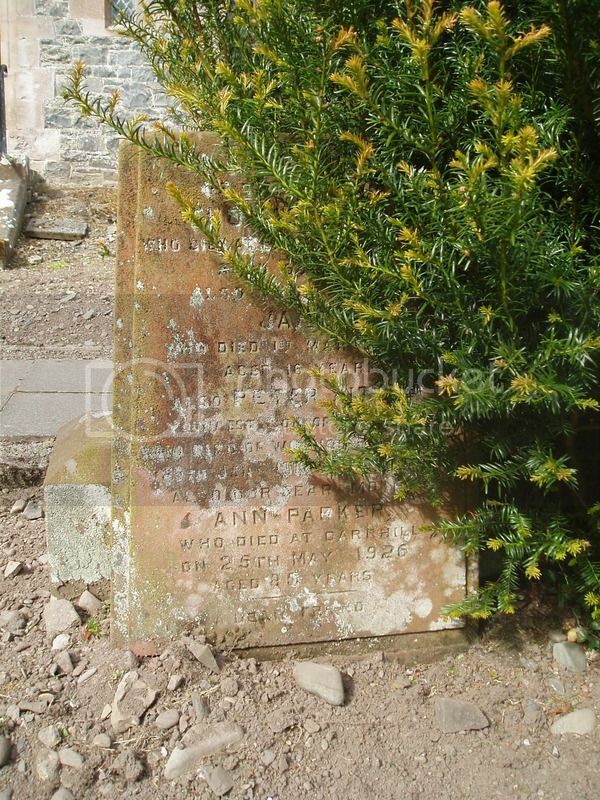 The headstone reads: In loving memory of their father Thomas Aitken d at Barrhill 1 Jul 1907 aged 65y. 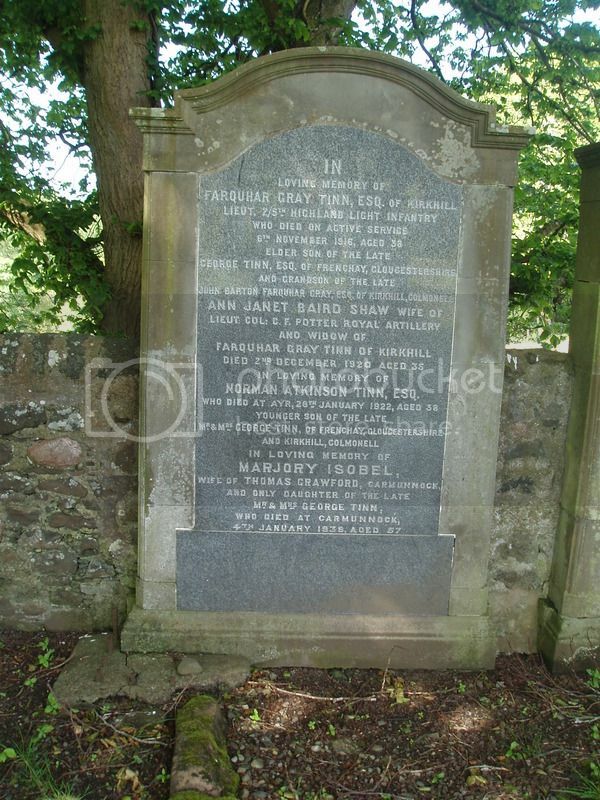 Also their sister Janet d 1 Mar 1888 aged 16y. Also Peter Aitken, youngest son of the above, d of wounds on France 29 Jan 1918 aged 30y. 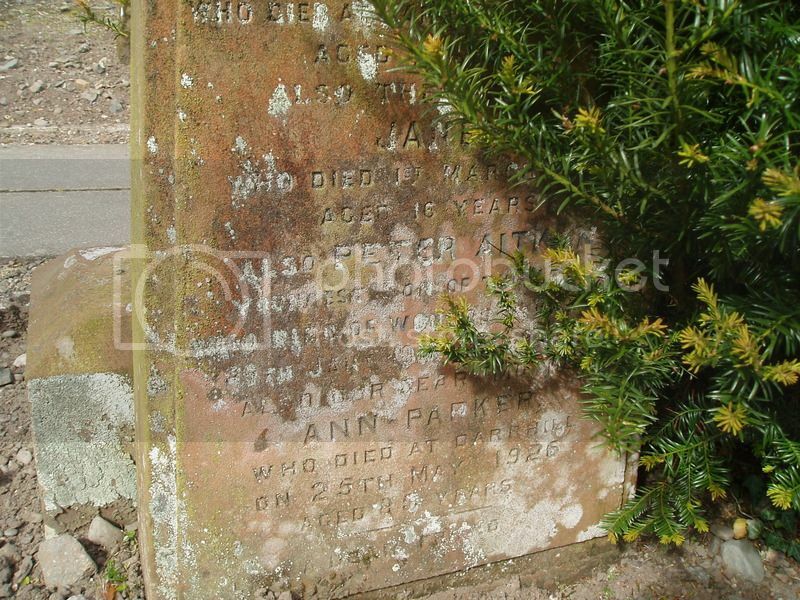 Also our dear mother Ann Parker d at Barrhill 25 May 1926 aged 80y. Dear Friend. 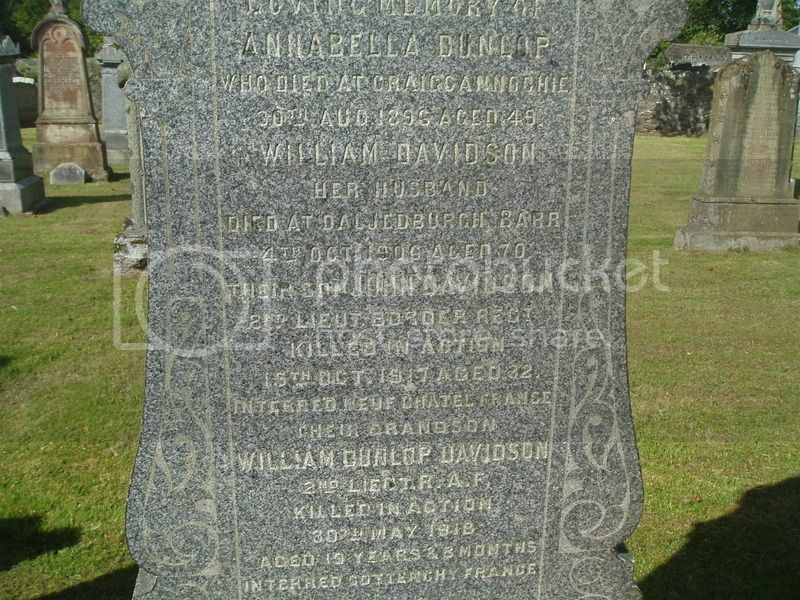 Additional information: Son of William and Bessie Thomasina Davidson, of Greenfield House, Shettleston, Glasgow. Born East Dulwich, London. 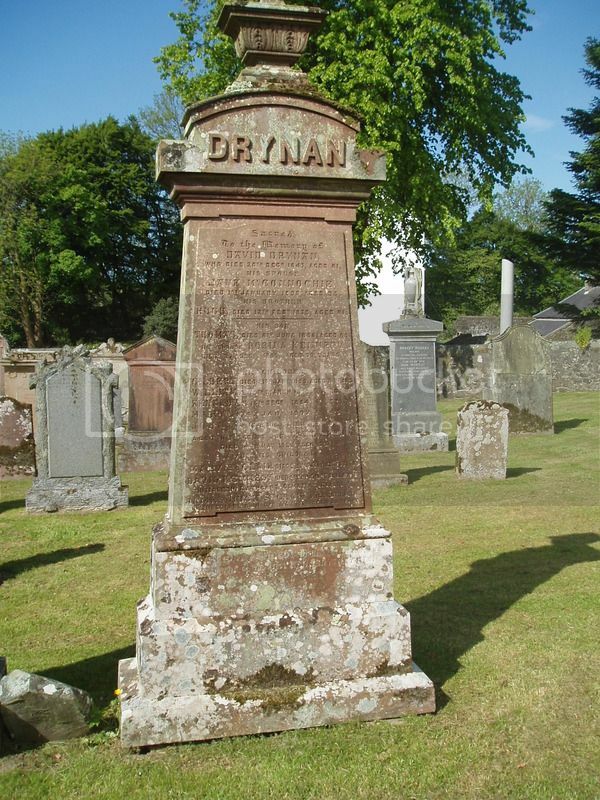 Additional information: Son of Jane S Drynan, of "The Yett", Colmonell, Ayrshire, and the late David Drynan. Cemetery: Carnieres Communal Cemetery Extension. 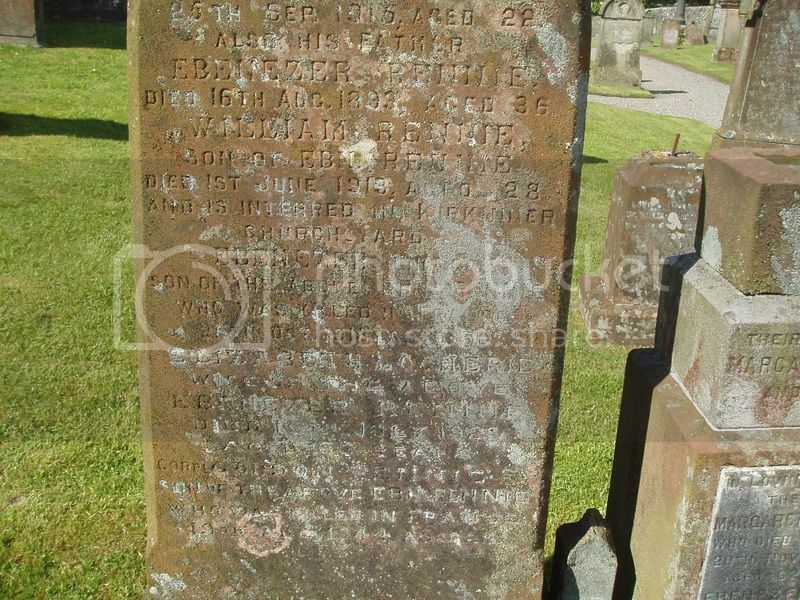 Additional information: Son of Jessie and the late James McClung, of Airds, Mossdale, Kircudbrightshire, Scotland. Ken Morrison has been able to provide some more information on James McClung who is named on Colmonell and Kells Parish War Memorials and on the memorial in Pinwherry School. Enlisted September 1915. Served in Egypt, Armentiers, Somme, Arras, Messines, Ypres. 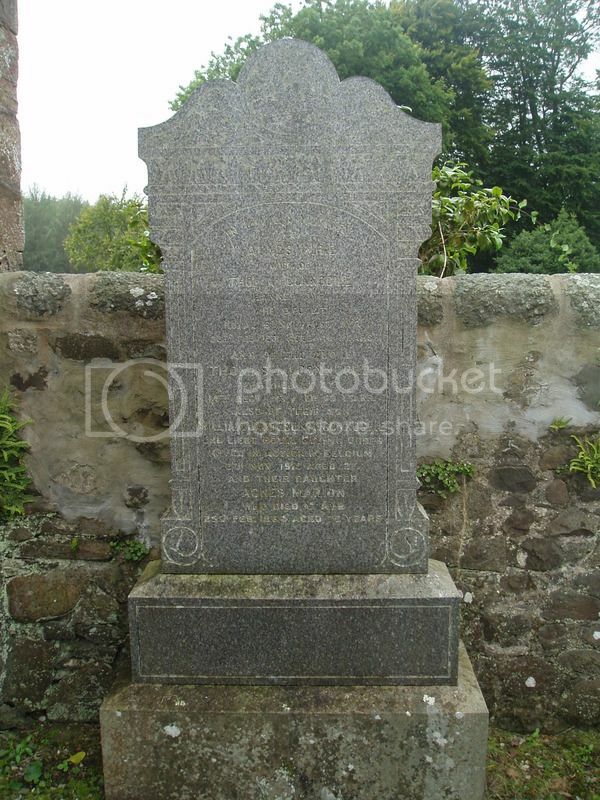 (Source:SRoH) Born 1875 at Pinwherry, Colmonell, Ayrshire. 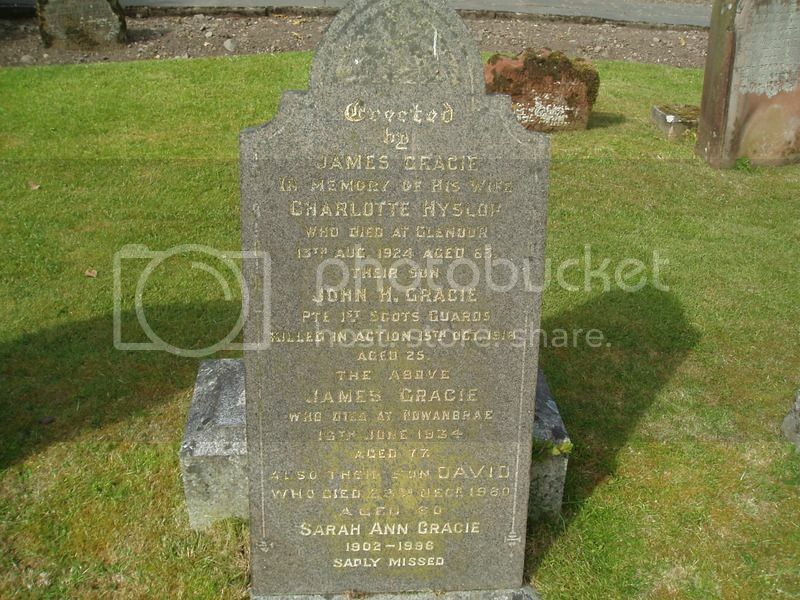 (Source:SNWM and GRoS – Birth Register) Son of James and Jessie (Murray) McClung of Airds, Mossdale, Kells. 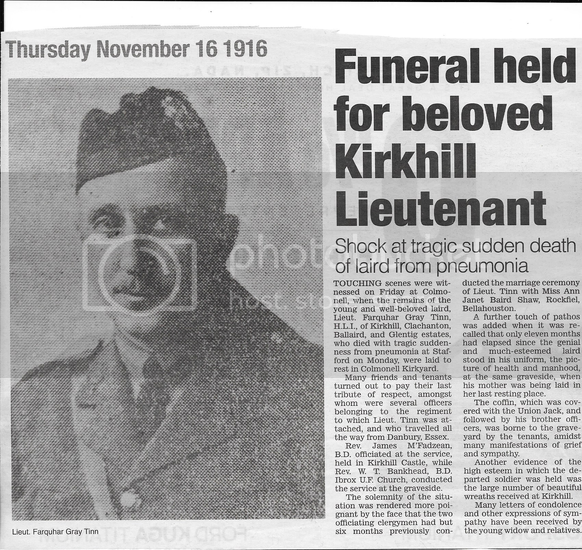 (Source:CWGC and D&G Standard 18/1/1913 page 5c – Obit. For James senior) Died of Wounds – 11 June 1917. Additional information: Son of Thomas G and Edith M McClung of Durban. Natal, South Africa. The headstone reads: Erected by James McClung of Pinwherry in memory of his father Andrew McClung d at Pinwherry 5 Aug 1866 aged 70. 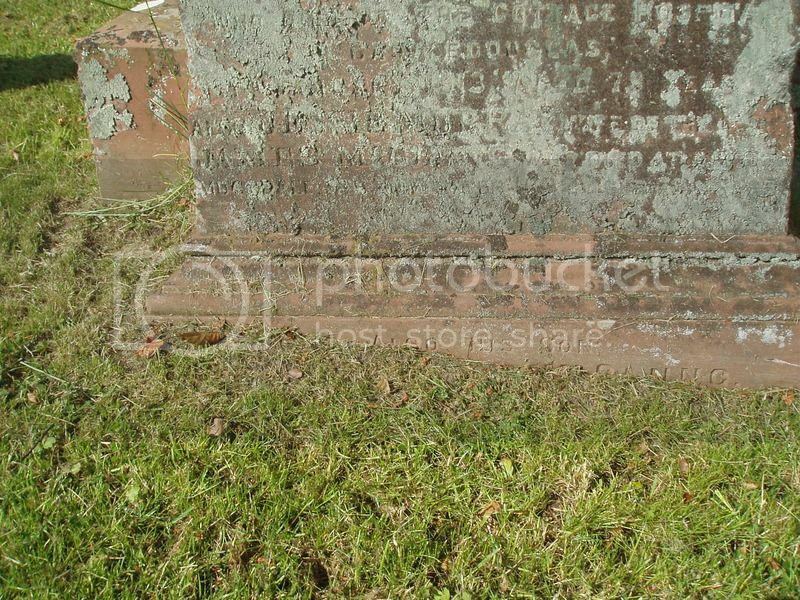 Also his uncle Gilbert McClung Esq of Pinwherry d 27 Mar 1865 aged 76. 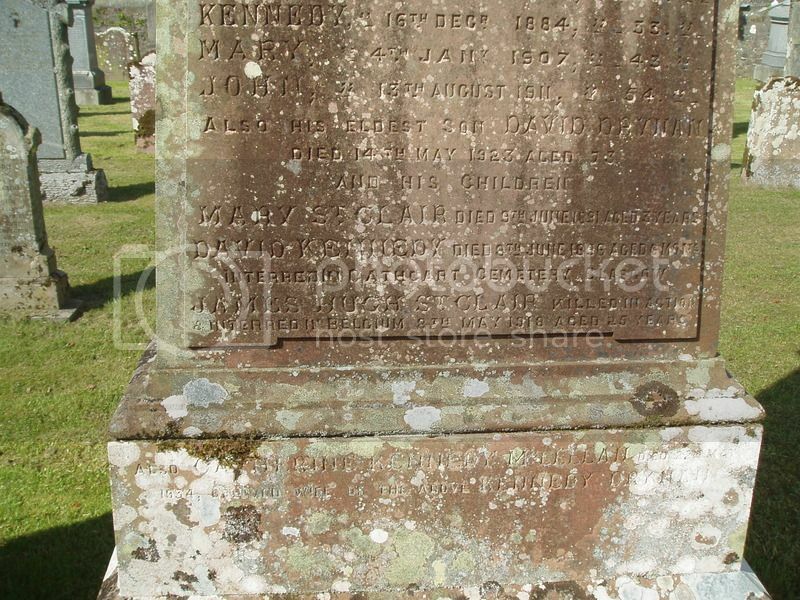 Also of his daughter Jeanie d at Airds of Kells, New Galloway 14 Feb 1902 aged 31. 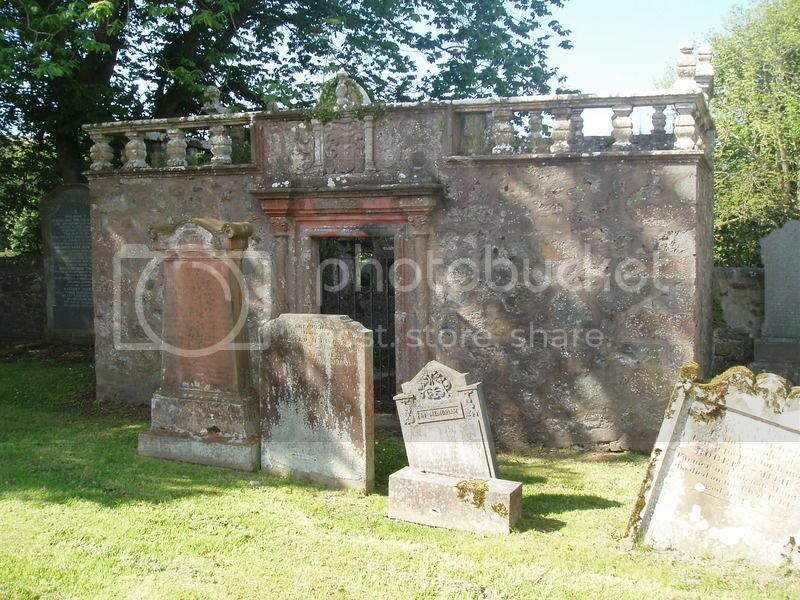 Also of the above James McClung d at the Cottage Hospital Castle Douglas 11 Jan 1913 aged 79y. 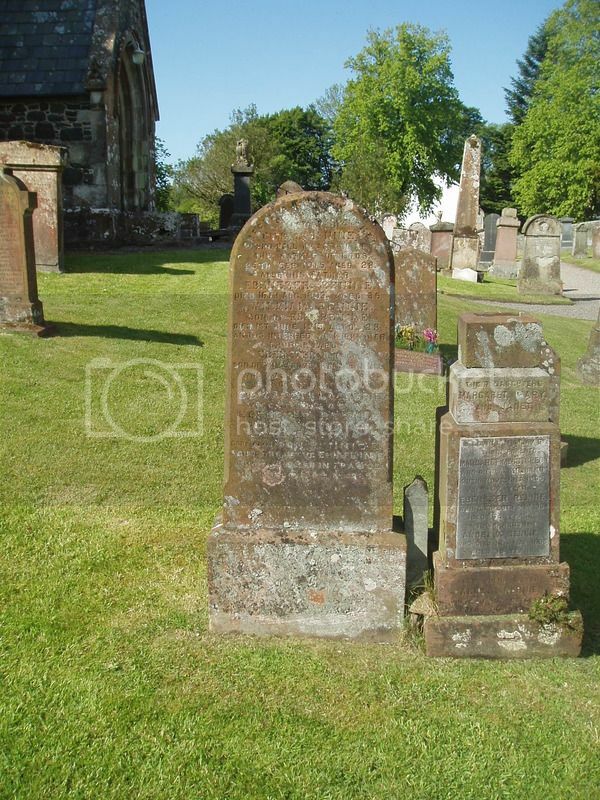 Also Jessie Murray wife of the above James McClung d at Airds, Mossdale 9 Nov 1922 aged 78y. Also his son Gunner James died of wounds in action 11 Jun 1917 at Australian Hospital Wimereux, Farnce, aged 42y. Gilbert Murray McClung, Royal Natal Carabineers killed in Italy 30 Jun 1944 aged 20 years dearly loved son of Gilbert and Edith McClung of Durban, Natal and grandson of James McClung. 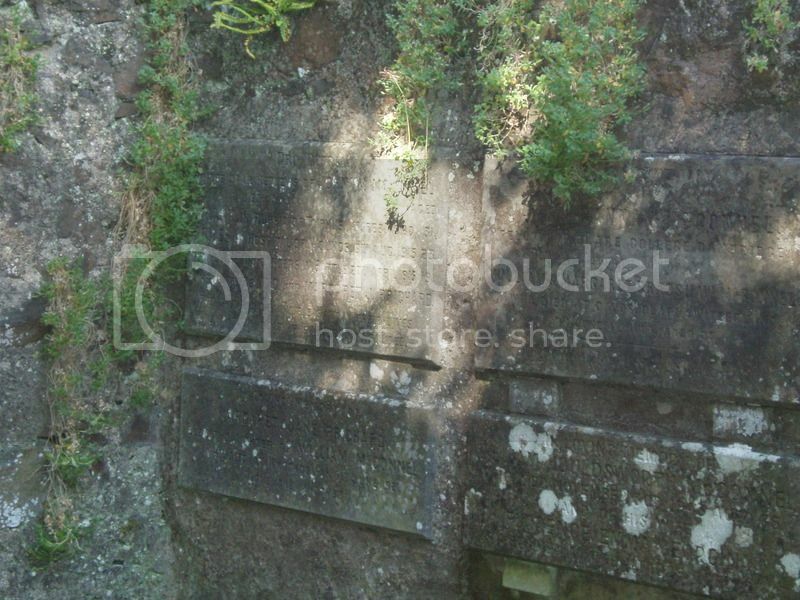 Knockdolian Vault contains memorial to the McConnel family. Unfortunately the iron gate was locked so camera work was a little hit and miss! Additional information: Son of William Houldsworth McConnel and Florence McConnel, of Heath End House, Basingstoke; husband of M.C. McConnel, of Polydores, Holmer Green, Amersham, Bucks. Educated at Winchester. Plaque reads: In loving memory of Merrick Hugh McConnel, Major RA who fell in the Great War 1914-1918 b 6 Nov 1884 d 14 Sep 1917. Eryl McConnel b 30 Jun 1889 d 26 Feb 1913. George Malcolm McConnel b at Knockdolian 9 Jun 1893 d 28 April 1908, children of William Houldsworth McConnel. 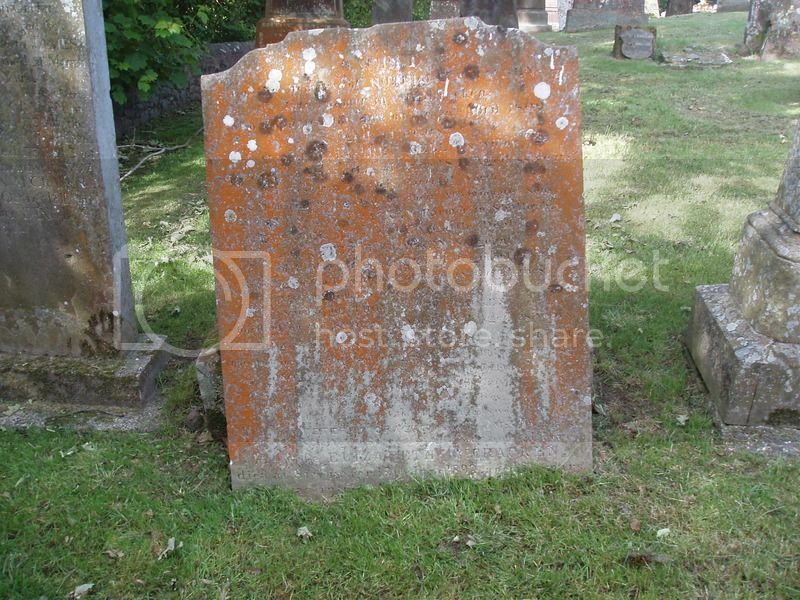 Additional information: Son of Rev Charles Collwyn Prichard, MA, Rector of Alresford. His brother Rowland George Prichard also fell. Additional information: Son of Rev Charles Collwyn Prichard, MA, Rector of Alresford. His brother Frederick Giles also fell. Plaque reads: Pro Patria. Three dear nephews of John McConnel, Frank d in Russia of typhus 1 Feb 1920 aged 31. Giles d in hospital of wounds 9 Aug 1915 aged 23. Rowland d in Flanders in battle 27 Apr 1915 aged 19, sons of the Rev GC and Margaret J Prichard. "They were lovel and pleasant in their lives and in their death they were not divided. 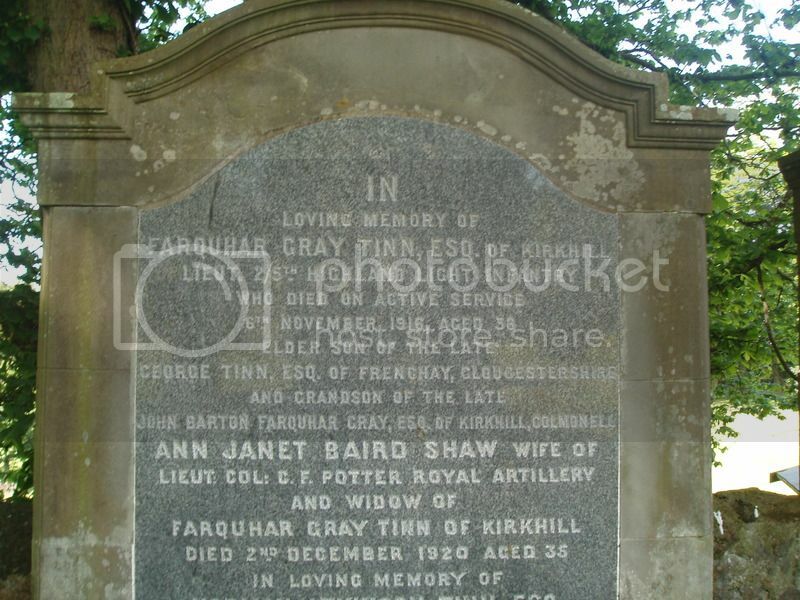 Died of Wounds – 26 October 1918. The headstone reads: Erected by his mother in loving memory of Corpl A Rennie who fell in action at the Battle of Loos 25 Sep 1915 aged 22. 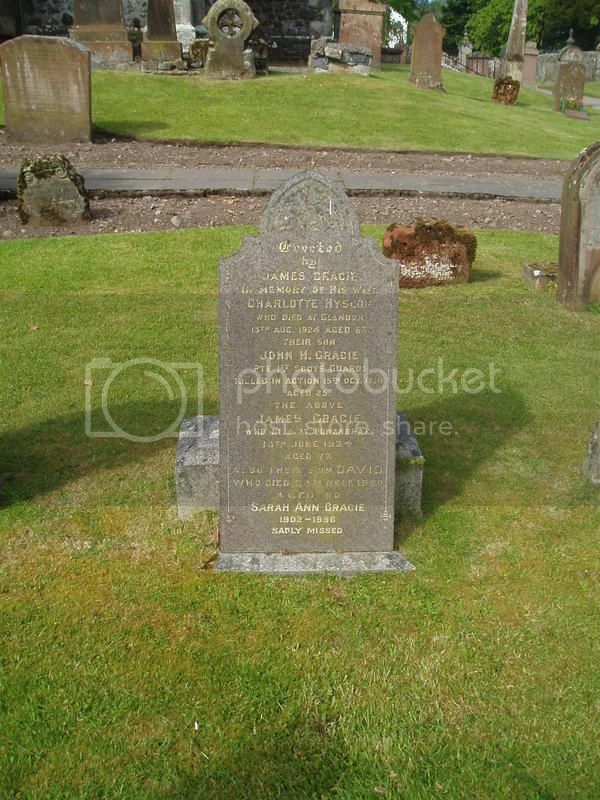 Also his father Ebenezer Rennie 16 Aug 1898 aged 36. 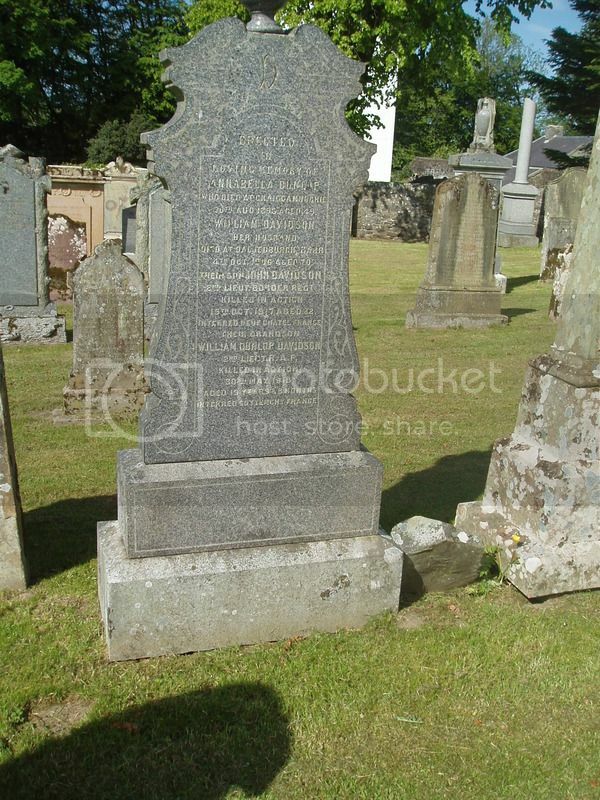 William Rennie son of Ebn Rennie d 1 Jun 1913 aged 28 and is interred in Kirkinner Churchyard. Ebenezer Lnc Cpl son of the above Ebn Rennie who was killed in France 26 Oct 1918 aged 31. 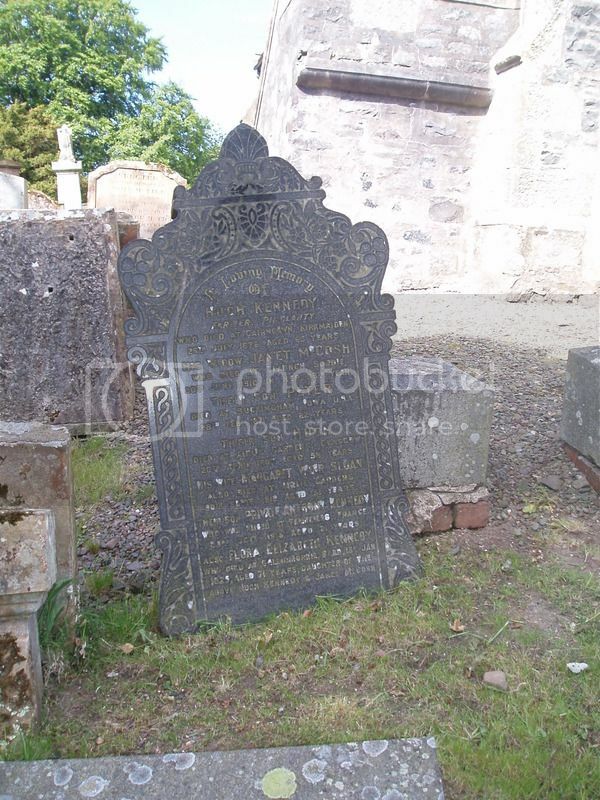 Elizabeth Locherie wife of the above Ebenezer Rennie d 15 Jul 1929 aged 63y. 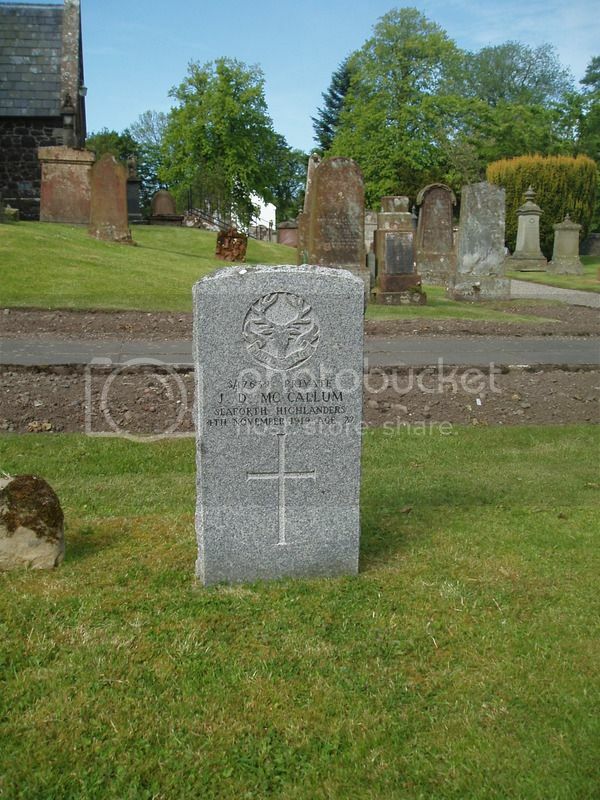 Corpl Gordon rennie son of the above Ebn Rennie who waskilled in France 19 Aug 1944 aged 28. 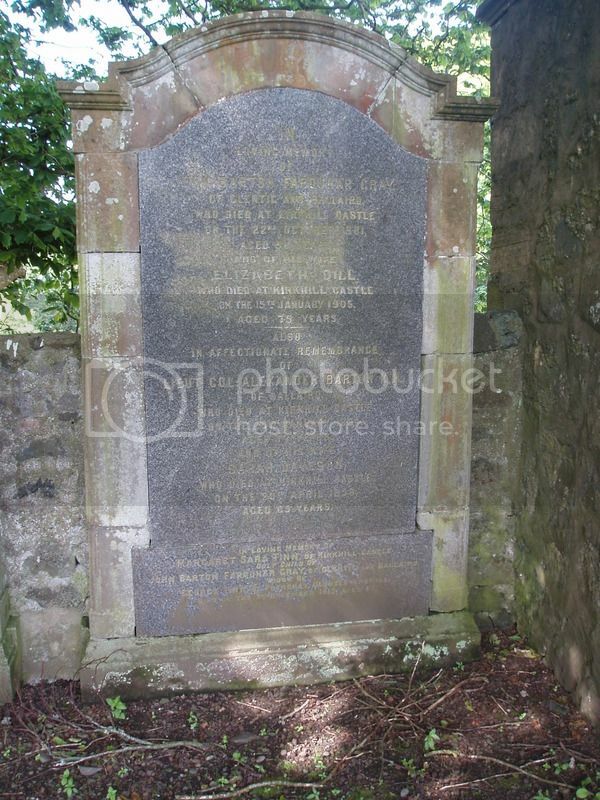 Sacred to the memory of Robert McCracken late farmer of Strabracken d 20 Apr 1809 aged 77y. 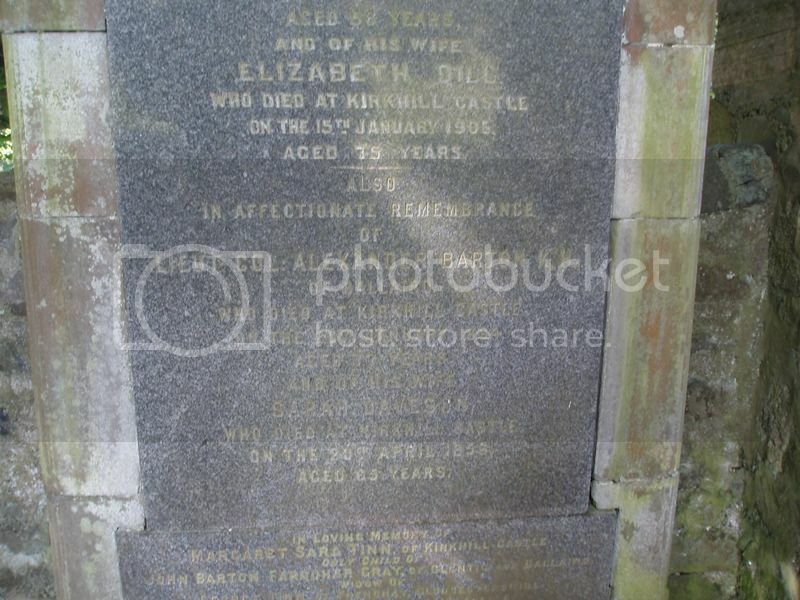 Also of Margaret Bell his widow d 24 Jun 1841 aged 88 y. 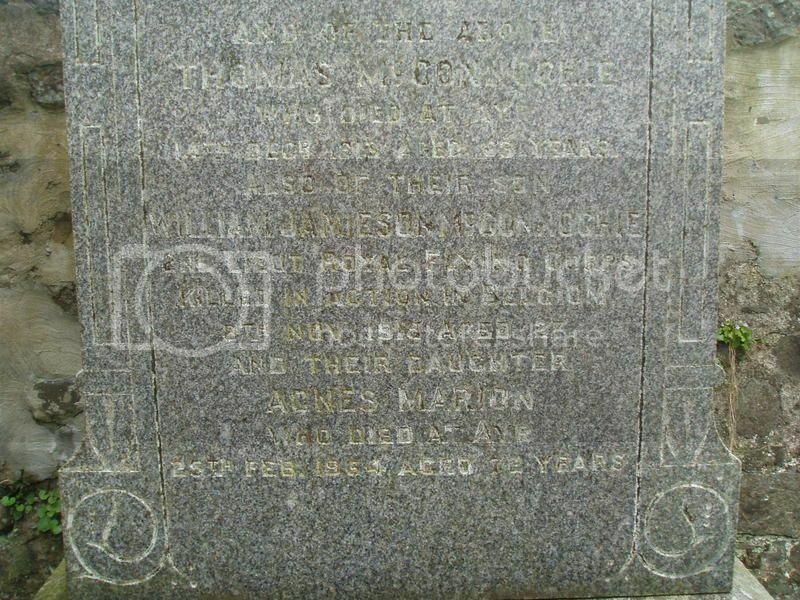 In testimony of their parental worth this memorial is erected by their affectionate sons Thomas A McCracken, farmer in Shalloch; Alexander McCracken, cattle dealer; Peter McCracken sergeant in HM 2nd or Queen's Royal Regiment serving in the Presidency of Bombay, East Indies. ...... 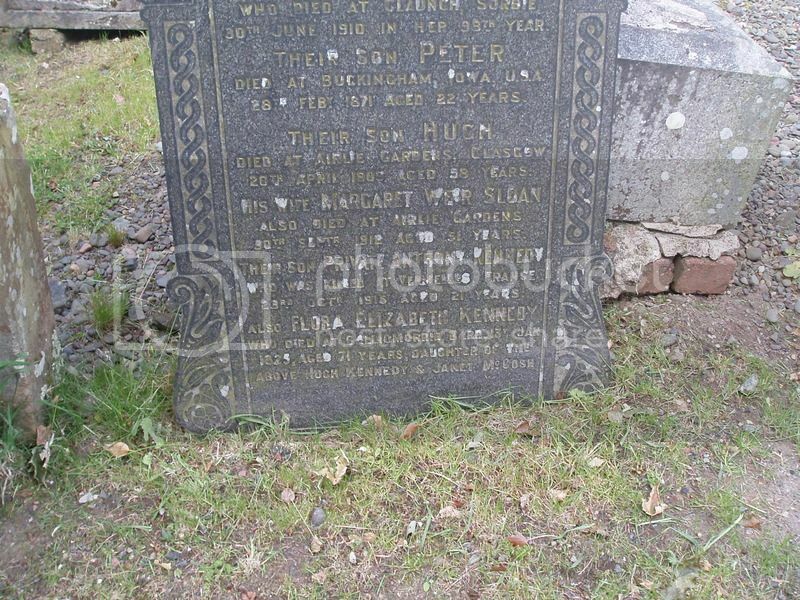 The above Peter McCracken d at Maybole 31 Aug 1863 aged 66y and was buried here. 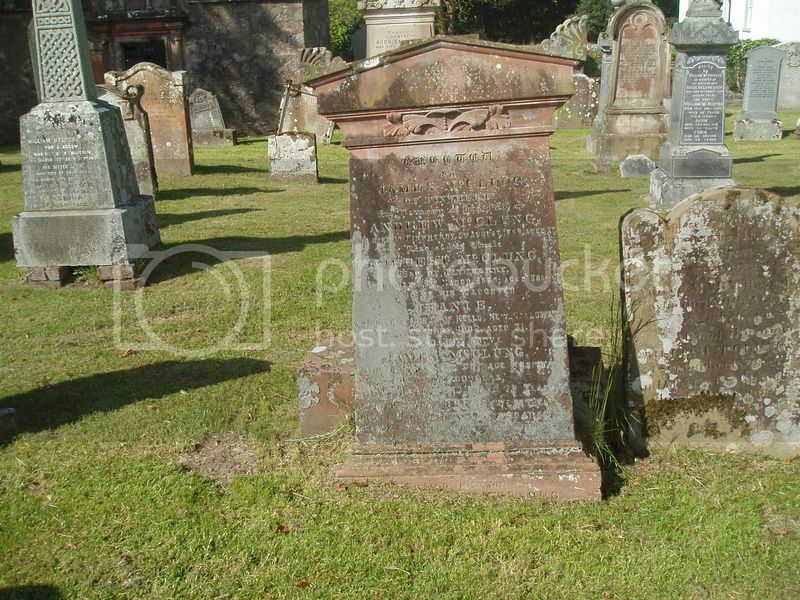 His wife Elizabeth McCracken d at Stranraer 19 Jun 1892 aged 73 y and was interred in the cemetery there. 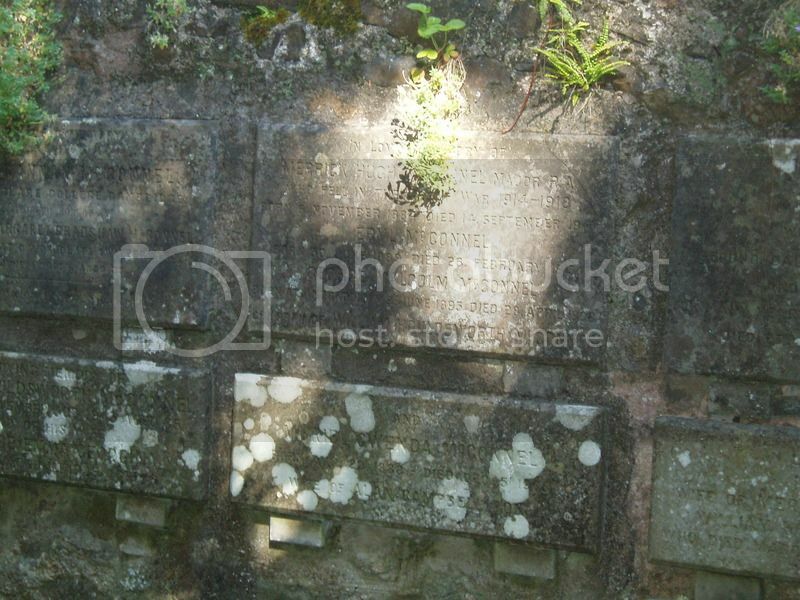 The headstone also states that Peter McCracken's eldest son, William, was Chief Officer on the ship Rozelle which sailed from Shields 17 Dec 1879 bound for Bombay and was never more heard of.